Labor disruptions characterized the production of cigars in Tampa during the early 1900s. Many of the disputes between manufacturers and workers turned violent and resembled something you’d see in a Western film. Abductions, shootings, and lynching were just some of the plotlines that graced these production standoffs. 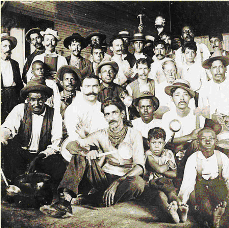 One of these battles among the industry’s good, bad, and ugly reached an epic pinnacle in 1901, when a wage dispute between Cuesta-Rey and a local, predominately Cuban cigar workers’ union resulted in a violent strike that crippled the Tampa economy and led to kidnappings and deportations. Sources can’t agree on the number of men involved, but somewhere between 6 and 16 cigar workers were kidnapped by a group of vigilantes, deported by boat to a deserted beach in Central America, and warned to never be seen in Tampa again. Well, those brave men eventually made it back to Tampa. Their story has been fictionalized in the novel The Cigar Maker, but the tale was most stunningly captured in the memoir of Luis Barcia Guilaber, a Tampa cigar worker who was in his late thirties at the time of his abduction. Barcia portrays himself as the sincere underdog, a powerless but determined David squirming against the forces of a corporate Goliath. As Barcia says, he was fighting “a bunch of greedy cigar manufacturers…against thousands of underpaid workers who were requesting better wages.” Barcia captures the story of the labor dispute, his kidnapping, and his journey back to Tampa in memoirs written in 1957. During the labor dispute, rumor grew of a group of men who were clandestinely arresting and deporting suspected leaders of the labor dispute. Hearing this committee of armed citizens was headed for his house, Barcia turned off all lights and waited quietly in silence while men pounded on his back door and eventually entered his home. Barcia was captured, protested to no avail, and thrown in a trolley and taken to a boat with six other cigar workers. Barcia then describes a “pirate ship” that waited nearby. The cigar workers were loaded onto the ship which soon embarked and headed south into warmer air. For many days they travelled and eventually were dropped on a deserted beach in Honduras, left with little in the way of food and warned they would be killed if they ever returned to Tampa. The deportees set up camp on the beach and a short while later encountered a native, who helped them navigate to Ciudad Trujillo where the men were able to find a boat that took them back to Florida. The men were greeted with an enthusiastic reception (some say one of these men was later elected mayor of West Tampa). As for Barcia, he moved his family to St. Augustine, Florida, and continued to roll cigars. What do the labor disputes of 100 years ago say about today’s working conditions? Legal questions and dramatics aside, the cigar workers of 1901 wanted basically the same things that workers continue to want today: safe working conditions, competitive wages, fair treatment, and a chance to provide for their families. Over the past 100 years, legislation has protected both workers and companies from the extreme tactics known in the Old West, but Barcia’s fascinating history will always be with us. with maybe some meditation for the future.